Home > News > Are drivers at risk of losing their jobs? Are drivers at risk of losing their jobs? In December 2016, the White House released a report investigating the potential risks and consequences of artificial intelligence and automation technology . A short case study within this report describes the number of US jobs at risk from self-driving technology. The report identifies heavy and tractor trailer truck drivers and self-employed drivers as the most at risk of experiencing substantial changes or of losing their jobs to automated driving technology with job replacement weights of 80% and above (see table below). What is the potential impact on New Zealand’s transport sector? Given 2015 employment levels and drawing on the White House’s replacement rate estimates, an estimated 17,000-44,000 driver jobs are threatened by the emergence of automated driving technology. However, there is one factor that is not included in the White House report… time. 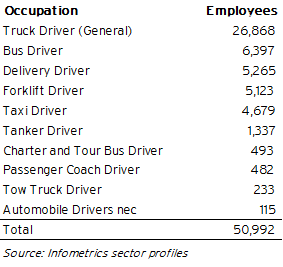 Given a business as usual outlook, Infometrics forecasts that the number of employed drivers in the economy will climb 4.3% to a total of around 53,200 people by 2021. Growth in New Zealand’s economy is expected to continue accelerating over the next few years, and with this, household spending is expected to climb. This growth in demand forms a strong basis for further increases in freight and courier activity . Furthermore, the shift towards online retail experiences has led to an overall rise in courier activity, and growth in this sector is expected to continue over the forecast horizon. But will jobs already be replaced by self-driving technology by 2021? Developments in this space suggest we are already on the road to seeing self-driving vehicles… on the road. Those at the forefront of self-driving technology say that self-driving technology is closer than you think, but also that the shift to completely automated vehicles replacing drivers will still take several years. What is often missed is what the transition period will look like. Early models of self-driving technology will not mean we can get out of the driver’s seat. Drivers will still need to drive, but driving will be easier. Many vehicles already use a degree of self-driving technology, such as adaptive cruise control. Adaptive, or autonomous, cruise control uses GPS positioning to navigate the camber of a corner, or change light settings for fog. The progression of the machine taking the wheel is already happening, but when experts say self-driving cars are just around the corner, these cars will still require driver in the driver’s seat for some time. Research by IHS Markit suggests that driver-controlled self-driving vehicles will be on our roads by 2021  , but fully driverless cars will only gather momentum in the decade from 2025. Using data from this IHS Markit report , we estimate that there could be 23,000 driver controlled self-driving cars on New Zealand roads in 2035 and 15,000 driverless self-driving cars. Due to the relatively higher cost of labour, we think that this technology will be more quickly adopted by businesses, first taxis and then, with legislation in place, heavy commercial vehicle transport. Delivery drivers and couriers are less immediately at risk of vehicle automation as not all of their role is driving – some of it being the door-to-door delivery service. However, in 2021, the effect of autonomous vehicle technology on our business as usual employment scenario is expected to be relatively minimal, with only about 50-100 jobs at risk of replacement at this time  . Getting a grip on when self-driving technology is due to hit provides more in depth analysis on when autonomous vehicles are due to make headway into the New Zealand vehicle market. Box 1: Automated Vehicle Case Study on page 15. One could argue that most trains and even planes (but not on most days at Wellington airport) already meet this classification. Given forecasts for the size of the self-driving vehicle fleet 2025.